Your island dream comes with a price tag. A planner shares tips for keeping costs in line. It’s no surprise that Hawaii ranks among the top places in the world to have a destination wedding. Between the picturesque scenery (like white sand beaches and lush valleys) and laid-back vibe, it’s hard to think of a more romantic place to get hitched. But nuptials in the Aloha State can quickly get expensive, so before you start planning yours, make sure you’re prepared for the costs and logistical challenges. Kristen Moux has orchestrated several weddings in Oahu since starting her event planning business four years ago. 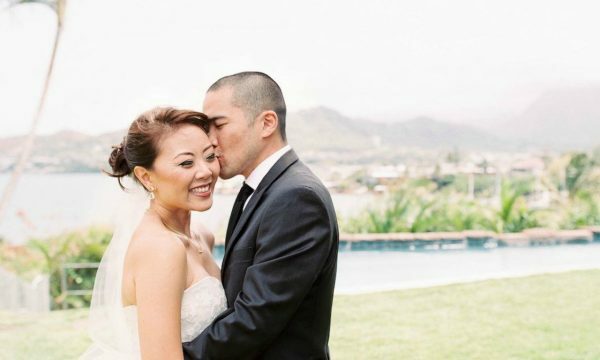 She shares her money-saving advice for couples who are considering a wedding in Hawaii. Don’t assume that a small destination wedding will automatically be cheaper than a larger, traditional wedding — especially if it’s going to be in Hawaii. Moux says that couples should plan to set aside at least $25,000. Although that amount is lower than the national average cost of a wedding ($33,391), a baseline of $25,000 is more than many couples expect to spend on an intimate affair. One contributing factor is that there are limited resources available on the islands. Any additional items — including certain flowers and food — must be flown in from the continental U.S. or other countries. Pick the right island. Hawaii is made up of eight main islands, including Oahu, Maui, Kauai, and, of course, the island of Hawaii (also known as the Big Island). Which island should you choose? Each island has its perks, so consider where you’ll have access to the wedding amenities that are most important to you and balance that with cost. Moux says Oahu is the cheapest and most convenient: "The other islands don't have as many vendors, amenities or choices in terms of decor, specialty linen or catering," she says. But you may prefer Maui's resorts or Kauai's secludedness. Make the most of your pre-wedding trip. Chances are high that you’ll be visiting at least once before the big day. Moux recommends booking far in advance for your wedding-related appointments, including food tastings, hair and makeup trials, and venue walk-throughs, so you have a better chance of consolidating them and reducing the need for multiple trips. » MORE: Visiting Hawaii? Find the right travel card to help you save on your flight. Featured image by Rachel Robertson Photography.